The English artist John Constable (1776-1837) painted landscapes throughout his life, and his pastoral views of the gently undulating Essex-Suffolk borderlands and pictures of London as seen from Hampstead Heath have become iconic, commanding some of the highest prices at auction of any British landscape painter. 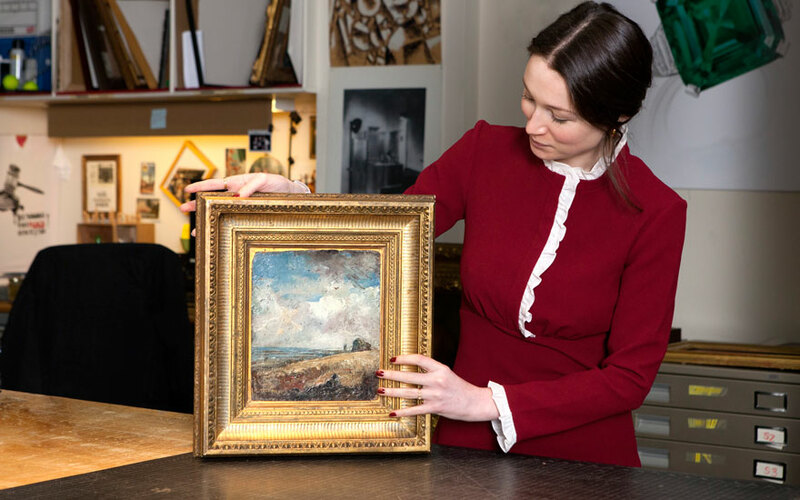 ‘A big part of what makes Constable so acclaimed is his amazing skill for capturing weather in paint,’ says Louisa Howard, an Old Master Paintings specialist at Christie’s in New York. The unusual evolution of this particular picture sheds light on how deep this obsession ran. Painted on one side of this artist’s board is a landscape of Constable’s native Dedham Vale, with the village’s church tower on the horizon and a single brown skylark soaring on an updraft. The clouds above, which Constable was known to study with scientific detail, turn from pink to white to grey, and show a rainstorm coming in from the distance. A pencil sketch held in the collection of the Victoria and Albert Museum in London, however, does shed light on where Constable got his inspiration from. Depicting the same view, from the same spot, the picture is a smaller-scale verbatim image of the present oil on board — only the skylark has shifted slightly. The drawing in question comes from a sketchbook Constable filled in the summer of 1813. Without the evidence of the earlier drawing, Howard believes it would be almost impossible for Constable to have captured the light and weather with such accuracy without being outdoors. The reverse of the piece of millboard contains another clue to how Constable worked in his studio. A white cow is painted in profile, standing in shallow water against a backdrop of trees. ‘This painting most probably belongs to the artist’s series of cow studies painted at least a decade earlier in his career,’ Howard explains. ‘Millboard is suited to travel because it is light and portable, and these cows were most likely painted en plein air,’ continues the specialist, who says she can imagine Constable coming home from a day of painting and storing this board away, only to pick it up many years later and re-use the other side for the landscape. Because of its importance, the double-sided painting has passed through the hands of two of the most important art dealers and collectors of the past century, Eugene Thaw, then Richard L. Feigen. But the question is, are you getting double the art for your money?